Fastpacking is a combination of backpacking and running. It offers an ideal blend of long distance running, freedom to camp, and the logistical challenge of carrying exactly what you need but no more. This entry was posted in Trail running and tagged #thisgirlcan, adventure, backpacking, Camping, exercise, fastpacking, Fell running, Films Books & Art, Hiking, outdoors, peak district, running, Trail running, travel, wellbeing, Women in adventure on June 11, 2016 by Anna Paxton. This entry was posted in Race reports, Trail running and tagged #thisgirlcan, exercise, Fell running, outdoors, peak district, running, trail race, Trail running, travel, wellbeing, Women in adventure on April 12, 2016 by Anna Paxton. Having previewed some of the films in the Women in Adventure category I was excited to attend the ShAFF networking event to hear the women that made and appear in the films talking about their experiences. Festival organiser Lissa Cook was keen to explain that the theme of Women in Adventure was something that ran right through the heart of the festival, not a separate or minority part of it. The panel and networking event provided a forum to discuss issues specific to women, and the aims were celebration, inspiration, sourcing, conversation, and networking. The event started with a celebration of some of this year’s films, showing clips from the Women in Adventure category (made by or featuring women). Selected by ShAFF judge Claire-Jane Carter, they demonstrated the wider themes of the festival, some of them thoughtful, emotional, funny, or that played with the concept of gender roles and what we expect of women. Danielle Sellwood of the Women’s Sport Trust introduced the discussion, reminding us with some shocking statistics that as with many industries there is still a way to go before women have equality of opportunity and all that comes with it – professional recognition, sponsorship, funding, and equal levels of participation. This led to wider discussion in form of Q&A with the panel. One of the critical questions addressed whether it is necessary or counterproductive to categorise ‘women’s’ films? For some the focus on gender may not feel helpful or relevant – in some cases even patronising. The panel recognised the responsibility of filmmakers to consider the way they represent individuals in the editing of their films – are negative stereotypes enforced if we see women crying or expressing strong emotions? Freelance producer and director Brenda Piekarski is aware that there is power in the choices made by filmmakers as they edit and interpret what they capture. With filmmaker Jen Randall, she discussed a ‘movement’ in film making away from action and focusing on storytelling. She described it as a search for authenticity and truthfulness, telling the story of the individual whatever that may be. The requirement for authenticity and quality was reflected in the selection process where there was no positive discrimination, every film was judged by the same demanding criteria. Having selected the films on merit though, there is a purpose in identifying levels of representation of women. Increasing representation and inclusion isn’t just about high profile women, but as Danielle says “you can’t be what you can’t see.” We need more stories to be spread as widely as possible – and this means more sponsorship and support. Women that are making a career out of something that they love, work hard at and excel in should be recognised for it. As adventurer Squash Falconer and stunt woman Steph Carey explained, in the moment of action they are not aware of their gender, and their achievements don’t need to be increased or diminished because they happen to be female. Some women in high profile positions do feel obliged to make things better for the women that come after them, and to achieve this there are several issues to tackle. This includes raising women’s confidence and sometimes challenging the way that we perceive ourselves. It is exposing to share, and it requires women to be brave enough to share their stories. US Ultra Runner Nikki Kimball in Finding Traction tells a deeply personal story about how running helps her survive depression. Professional climber Mina Leslie-Wujastyk in Project Mina temporarily breaks down under the pressure to achieve, demonstrating that confidence can be an issue no matter what your level of ability. Women may feel that their stories aren’t interesting, aren’t worth telling, or worry about how they will be perceived, but women like Nikki and Mina are leading the way for other women. The moments of vulnerability are where we all relate and connect, through that connection comes inspiration. The event ended with a networking session, an opportunity to put names to faces and for people within the industry to meet. In future the aim is that it will not be necessary to specifically promote women due to gender inequality, and ShAFF is working towards a ten year plan. The outdoors industry is fortunate that there are women and men with the vision and the passion to effect real change. Thank you to ShAFF for starting this conversation and for inviting us to be a part of it. 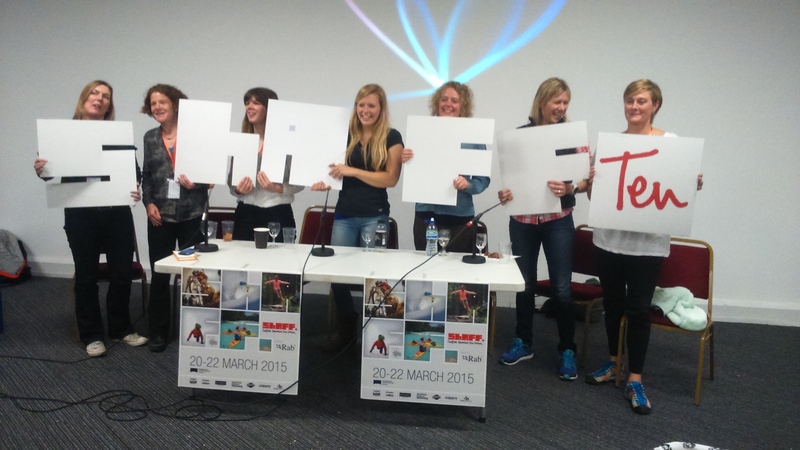 This entry was posted in Events, Films Books & Art, News, Women in adventure and tagged #ShAFF2015, #thisgirlcan, adventure, climbing, Trail running, wellbeing on March 26, 2015 by Anna Paxton. This week Sport England launched a campaign “to celebrate active women who are doing their thing no matter how well they do it, or how they look” www.thisgirlcan.co.uk. It features women participating in activities like cycling, zumba, and climbing. It’s so liberating to see these real women, and I have personally been reflecting on how important it is to have female role models to encourage and inspire me. Although I train and climb with equal numbers of men and women, I particularly value the time I spend with female friends. We are more evenly matched in terms of strength and performance, which means that we participate on an equal footing and are more likely to share common goals to work towards. I find it empowering to take decisions and plan together, and feel especially proud of what I have achieved through team work with my female friends, whether climbing a hard route or navigating a race in the hills. Beyond training and performance, being active together creates real quality time, shared experiences, and lays the foundations for strong and supportive friendships. In the media and coverage of the outdoors world I generally find strong women’s voices are less common. I don’t know if that is because there are proportionally fewer women participating, whether fewer women seek to publicise and share their adventures, or whether they struggle to have their voices heard in stereotypically more masculine environments. Or maybe I just haven’t been looking in the right places. I don’t need my role models to be exceptional in terms of performance. It’s great to celebrate women that are at the top of their game and pushing the boundaries, but regardless of your level of performance I love to see the places that you are being active, and the things that you are doing, because if you can do it, so can I. How women are presented in the media and online is important, and This Girl Can feels so right because it has a message that all women can relate to. We need to see realistic images of healthy women. We can celebrate using our female bodies without sexualising them. We do not need make up or air brushing to make us look healthy and vibrant. Packing light and having access to minimal facilities has challenged my assumptions about the ‘essentials’ of life, including realising that in certain circumstances make up has no practical use. Pushing my physical and mental limits has taken me to a place where there is no room to think about how I look. Being active gives me a sense of wellbeing and achievement that feels so good that it pushes out the insecurities about how I might look while I’m doing it. It can be a vulnerable feeling to share your thoughts and experiences, but I believe that we are all role models and mentors, encouraging and inspiring each other. I would like to see active women increasing our representation, and this means building confidence in our skills and abilities, finding our voices and being comfortable sharing to a wider audience. It means recognising that our opinions and experiences have value. This entry was posted in News, Women in adventure and tagged #thisgirlcan, adventure, Camping, climbing, exercise, fitness, Hiking, mindfulness, Trail running, wellbeing on January 15, 2015 by Anna Paxton. 1 – Discover what you love, and do more of it. It’s important to me that I enjoy what I choose to do with my free time, and that it doesn’t feel like a pressure or a chore. At the moment it isn’t really practical to climb outdoors after work, but it is possible to run. I would like to get faster, I could go to the track and do speed sessions. But the thought of it doesn’t inspire me, and in the past I have found that the pressure of ‘having’ to stick to a training programme actually demotivates me. There have been many great moments, but one that particularly inspired me recently was pausing on a night time run at one of my favourite places at Stanage. Turning the headtorch off, looking across at the moonlit shapes of the hills on the horizon and the patterns of the lights in the Hope Valley I saw a totally new perspective on the familiar landscape that I love. When I finish work, even when it’s dark and the weather is wild, there is no part of me that doesn’t want to get out there and run through the Peaks because I know that each run will give me a unique experience. I don’t think of it as training, but as I have stopped putting pressure on myself to achieve and just enjoyed what I’m doing, I’m finding that improvements are coming naturally. 2 – Find a goal that inspires you, see yourself achieving it, and feel the real connection between that longer term vision and today’s training. I find it easy to set myself targets – for example to run a faster 10k, and it’s good to work towards them so that I can measure my progress. But targets can become a pressure, something else to beat myself up about if I don’t make progress fast enough, or if I ‘fail’ to live up to them. This winter I also have a vision – I want to go further so that I have the opportunity to see more. I want to visit remote places and learn how to be self sufficient and leave no trace. I want to acclimatise to alpine air and run up and down mountains. I want to smell warm pines and run on soft sandy trails. These goals are not quantifiable – there are no criteria to pass or fail. The only thing that will stop me is if I don’t go and do it. It has given me something to really work for, a reason to run further and faster. To be capable of achieving and enjoying them I have to train, and having such vivid goals means that I really feel like every step I train is a step that will enable me to live those dreams. 3 – Connect with people with similar attitudes and interests, stay in touch and support each other. It’s great to spend time with people who are enjoying what they’re doing. I have gained so much inspiration through meeting or reading about people that are passionate about what they do. I have fantastic training partners and friends that are always up for it, full of ideas and positivity. Through their attitudes and achievements they are proving to me what is possible. I have also found that reading magazines and following other runners, climbers, and hikers online has really made me feel part of a community and given me so many ideas for things I’d like to do. Whether we meet in person, or virtually, we are all part of a community that shares values, interests, passion, and energy. In whichever way works for you, give that support when you can, and take it when you need it. It’s so important to make positive choices about how you spend your time and who you spend it with. Trust yourself, listen to how you feel, and make what you do work for you. I want to say again – I know that it isn’t always easy, and sometimes even small steps can feel tough. If you feel like you struggle through winter, don’t be overwhelmed by the journey ahead, focus on those first small steps and have confidence that you are already increasing your motivation and creating the conditions to beat the winter blues. This entry was posted in Trail running and tagged climbing, exercise, motivation, outdoors, positive thinking, running, SAD, sports, Trail running, wellbeing on December 11, 2014 by Anna Paxton. In September this year I was fortunate to travel around California for the best part of a month, and I was looking forward to the holiday as a period to take time out and reflect on the big questions I felt life was asking me. It’s the longest time I’ve travelled and I was able to take so long because, as a result of the continuing public sector cuts, I was offered voluntary redundancy. After five years at the same place the time felt right to move on and I saw it as an opportunity. But needing to take potentially life changing decisions naturally caused me to question… What do I really want to be doing? Where do I want to be heading? What am I doing with my life??! 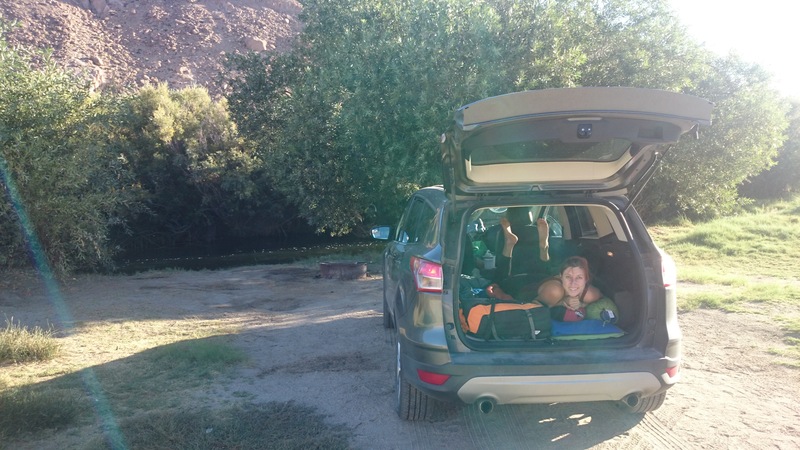 We flew into LA, driving for hours through hellish traffic to arrive at Joshua Tree national park in the dark, grateful to find a free space at the Hidden Valley campground. Our headtorches illuminated the bulk of the boulder-like formations that the camping spaces nestled beneath. We were woken by coyotes howling, one group yelping frantically nearby and another replying from somewhere in the distance. It was 6am, but with an alarm call like that there was no way we were going back to sleep. The sun had just come up, and looking around at the unfamiliar rocky landscape I felt I had travelled to another planet. Scrambling to the top of the tall ridge that formed the far side of the campground, I looked back down and saw an expanse of white sand and pale yellow-white granite. Over the other side lay a vast and perfectly flat plain crowded with the Joshua Trees themselves, their unusual shapes poised like joyful dancers. 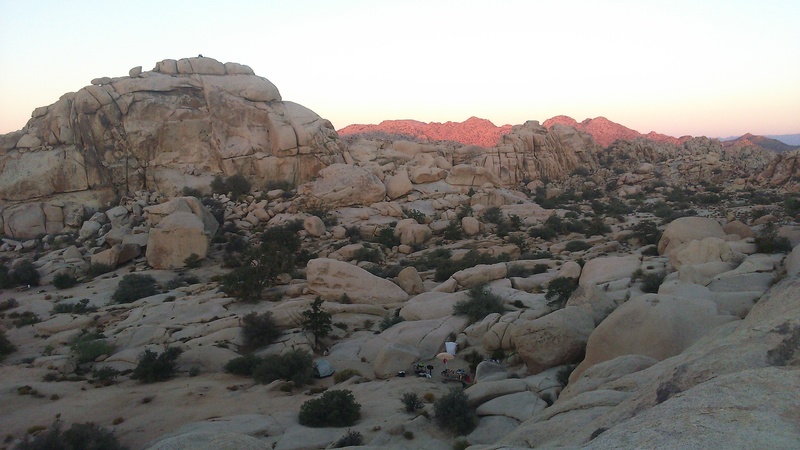 Joshua tree is beautiful and like nothing I had ever seen, and as the sun rose, the mountains on the horizon glowed a deep wild-salmon pink. When you’re car camping in California, life is simple. Finding it too hot in the south, we travelled up Highway 395 through Inyo County, the High Sierra mountains always visible to the West. Passing through Bishop, Mammoth, and on to Yosemite National Park, we stopped off at Pleasant Valley, Twin Lakes, and Tuolumne Meadows campgrounds. The days assumed a rhythm that started with the ritual of coffee. I love that solitary time in the morning before most people wake up, listening to the muted blaze of the stove for the moment that the pot bubbles announcing the arrival of coffee. The day seems suspended in that moment of waiting, perfect in its possibilities before caffeine catapults me into action. Each day we would climb, locating new crags, navigating walk-ins, and tackling the routes. Or I would hike, almost disbelieving at the start of the day that I really would be at that highest point of the horizon, and back again before dark. As darkness fell the various climbers, boulderers and hikers would reconvene at the campground to hear about each other’s days and plans for the next day. Food and drink tastes better when you’ve earned it, and as we clustered around the blue stove flames to cook we savoured the taste of local brewed ale, inventing ingenious ways to remove the bottle tops. Some nights the milky way would appear bright in the clear sky, and I watched its rotation feeling insignificant, peaceful, and incredibly lucky. As each day started with coffee, it ended with making the beds, another ritual which involves clearing the back of the car and making sure the roll mats are smooth, creating pillows out of down jackets, laying out the sleeping bags in the exactly the right position. And then – glorious sleep. Moment by moment by moment, I was absorbed. I didn’t think about the future, or worry about what might or might not happen. As a way of living, it felt so simple and so pure, focusing all my attention on each event in my day as it happened. I know it’s not possible to be on holiday constantly, I don’t want to run away from my life and become a rootless traveller. There’s a danger in living for future plans, as much as there is in living in the past. I went away thinking that time out would give me perspective, and I came back wanting the opposite of escapism. I want to be present right here, right now. Too much reflection can become a distraction, so maybe I did find the answer to the big questions… stop questioning. 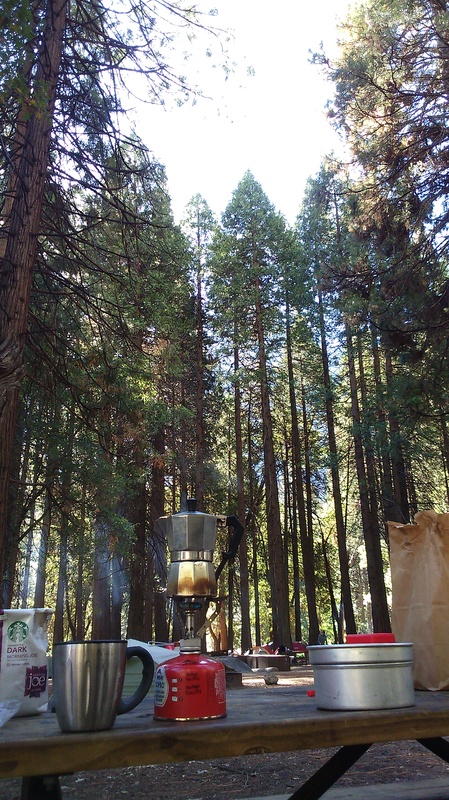 This entry was posted in Camping, Climbing and tagged california, Camping, climbing, Hiking, mindfulness, travel, wellbeing, yosemite on November 20, 2014 by Anna Paxton.